Ooooooooh I've always wanted a pure white fluffy Persian cat and this one here is purr-fect! Look at this adorable white kitty; I can almost feel her soft fluffy fur on my face just looking at the picture. I so wanna hug this little fur ball! And I'd surely wanna dress her up in all the cute kitty outfits from Pet Safari and Lil' Pheebs would definitely get jealous! Happy Fluffy Friday and have a terrific weekend! Share your fluffy friends with us every Friday! Whether it's a favourite stuffed toy or an adorable pet - basically anything fluffy, we'd love to see your pictures! Leave ONLY the POST URL here and grab the Fluffy Friday badge at Meow Diaries. All links are reserved STRICTLY for Fluffy Friday participants and any unrelated links will be deleted. OMG!!!!! She is so fluffy GP.. so fluffyful!! loL! that white cat is sooooo cute and huggable! woot woot! =-O =-O =-O =-O =-O Maxi! kucing dalam talian?? what does that mean Mariuca? Enjoy ur weekend Mon… I’ll be at DSH on Sat..for B’s appointment. Hopefully more good news yay! I email u la Mon hahahhahah so funny!!! yeap.. just change the code from linky site..
yelah.. so fluffy.. Awan is white with blue eyes but not fluffy lah.. lol! eh commentluv no work already kan? if not i want to remove code already. Yay LJ! I put BC here edi dearie.. I love fluffy meows, cause like teddy bear and look like toy he he, meow! how to remove code LJ? i don't laik la commentluv no work! this sure is a pretty fluff up ball of white.. hahahhahahahhahaa.. Happy Fluffy Friday marzie! Wow! so cute nya this little fluffy white cutie, Meow, Meow, would love to hug her too. I like looking at her cute flat face too. Errrr ...... geram sangat lah! You & B have a nice coming weekend. Holy floof! Wow! That is one fluffy kitty. Gorgeous! 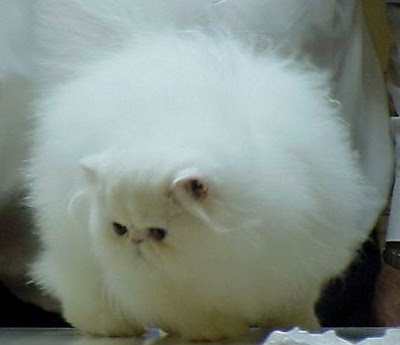 Looks like a ball of cotton la that cat LOL!